I closed a checking account a few days ago. It was with great reluctance, but they really left me no choice. I have had the account since I opened it in the early ’70s. At that time I also had a savings account at the same bank, the old-fashioned passbook savings account, where you brought in your book and they entered your deposits and withdrawls into your booklet. You had to bring it in to get your interest added too. I had the savings account since my teens. It was the account the Union, Sun & Journal opened when I had a paper route. They made you set aside some money each week into an escrow account in case you didn’t pay your bill. They kept the passbook, and if you stiffed them, they took it out. If you didn’t, when you quit, it was yours. You probably haven’t heard of the bank. 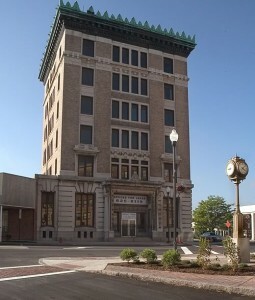 It was called Farmers and Mechanics Savings Bank and the building is still standing in Lockport. It had the kind of old-fashioned, ornate lobbys that you’d picture Jesse James and his gang coming into and robbing. Teller cages and marble and wrought iron work. Of course, no such thing ever happened here. I don’t remember it ever being robbed of more than a pen off the counter. They were chained down, anyway. Of course, today, the bank has another name and it’s one of the largest banks in the Eastern United States. In recent years, they have been on a buying spree, picking up branches all over from other banks. Along the way, they built a new, more modern office a couple of blocks down Main Street/East Avenue and changed the name to Lockport Savings Bank. That was good for a long time and although they did open a few new branches in the immediate area, they were strictly a local bank supporting the local area. I had the mortgage for my house there for 30 years. Through job changes and layoffs, they were convenient to deal with and willing to work with me when times were tough. In the late ’90s they decided to take the bank public and had a stock offering. As an account holder, I had the opportunity to buy stock at the advance price of $10 a share. It was pretty much assumed it was a sure thing to go up. I took a tax refund and bought 100 shares. I remember when I was there turning in my check for $1000, a man buying $25,000 worth. It was his mother’s retirement fund. It made my little investment seem, well, little. They changed the name of the bank again once it went public to First Niagara Bank. 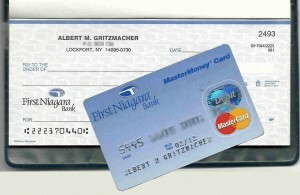 It became the cornerstone of First Niagara Financial Group, and is still called that today. My 100 shares have turned into around 400 through dividend reinvestments and a stock split. While the stock hasn’t shot up into the stratosphere, it’s value is usually well above that $10 initial offering and the dividends are steady. But like the changes to the bank over the years, the way I use a bank has changed as well. I rarely need to set foot into an office. Most of my banking is done online. The goal is to do all of it online and not need to go to the office. As a result, paper checks are becoming obsolete. Plastic and virtual are the keywords. I kept the checking account active after I retired because it had free ATM transactions and they were plentiful in this area. I was once driving home from Vermont and was low on cash and spotted a First Niagara in the little town near Lake Champlain I was driving through. That was a welcome surprise then. Today, it wouldn’t be a surprise at all, they have so many branches. But, I couldn’t get the account to work online. I had set up phone access for their dial-in banking system back when it was new. Unfortunately, I didn’t use it and forgot the access code. When I tried to switch to online access, I needed to give that code. Someone who had never used the phone banking was home-free, but I was kept out by my own account’s security. I went into the bank, talked to someone and they told me I had to do it online. I went online, and was told to call a phone number. The phone number couldn’t help me and told me I had to go into the bank. So, I never got it set up for online use. Of course, I had all that convenience at another banking outlet all along, so it wasn’t a big deal, but it kept it from being as useful to me as it could have been. I kept it for the ATM convenience and that’s about all. When I got a check for something that I had to take into a bank, I’d go and put a hundred bucks or so into it for a rainy day. But my real banking got done at the other institution. The final straw came recently, when they sent me a letter saying that it was going to cost me $7 a month to keep using the account. Well, it said more than that, and there were several other options besides the $7 service fee, but for the way I was using the account, I was going to be charged monthly for keeping the account open. So, I decided it was the end of an era and went into the bank, probably for the last time, and closed out the account. I did find one way to use the checking account online. I had it set up with PayPal and if someone sent me money using PayPal, I could have the money transferred into the account. But that happens only infrequently. One of the things I had to do after I closed it was to set up my PayPal account to work with my other checking account. As a stockholder, I’m happy that a costly account that doesn’t bring much money into the bank is gone. I hope my dividends go up! Now, what will I do with several boxes of paper checks I can’t use?